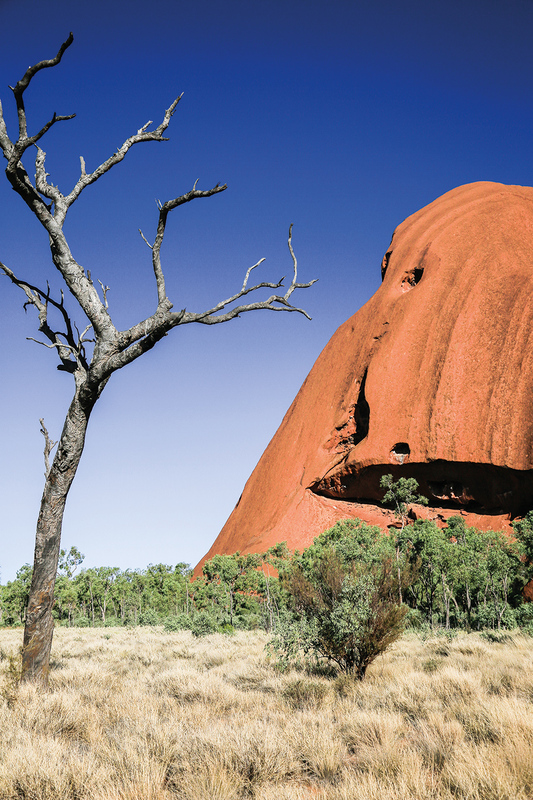 Discover the spiritual heart of Australia in style with a short break to Uluru combining luxury and adventure. 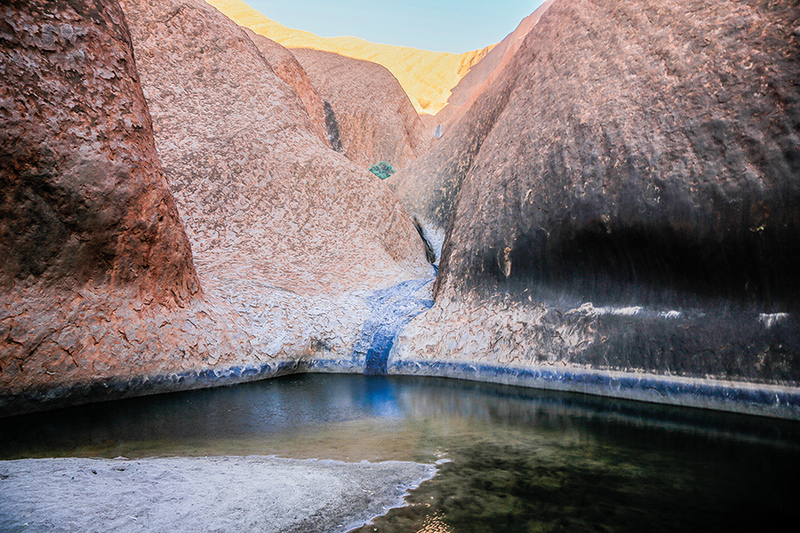 Nothing can prepare you for the majesty and mesmerising beauty of Uluru-Kata Tjuta National Park. It’s an ancient landscape with incredible tales to tell, and Uluru has an energy that stays with you long after you leave. It’s a sight to behold, soaring up from the barren outback scrublands and spinifex plains, glowing against the set against a stark, cloudless blue sky with its striking orange-red hue, its valleys, ridges, and hidden caves carved out over millennia. Our first morning starts with an oh-so-Aussie breakfast of bacon and egg rolls and homemade damper with Golden Syrup on a raised viewing point with Uluru and Kata Tjuta in the distance. Rugged up from the crisp pre-dawn desert air in our boots and scarves, with the colours of the desert coming alive at sunrise, it was the golden hour of the Desert Awakenings tour, as organised through our resort, Sails in the Desert, part of Ayers Rock Resort. 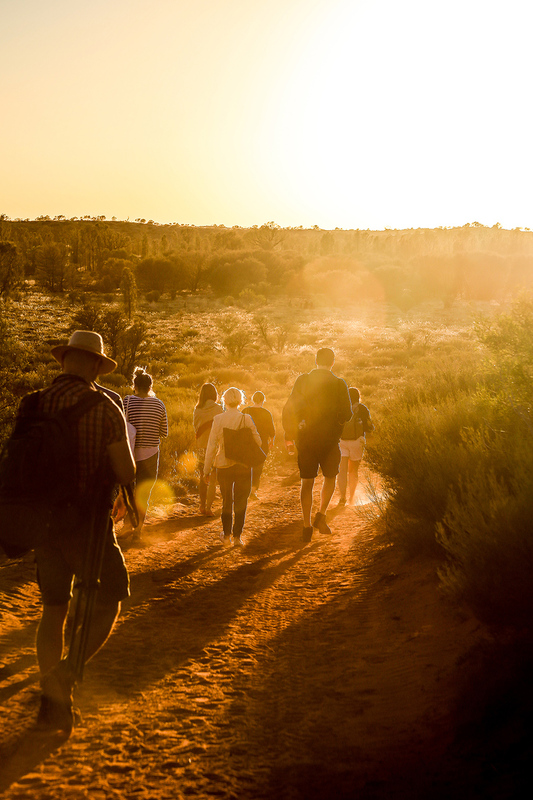 It’s one thing to simply gaze upon Uluru, but to really get intimate with the spiritual heart of Australia, you need to walk the land. 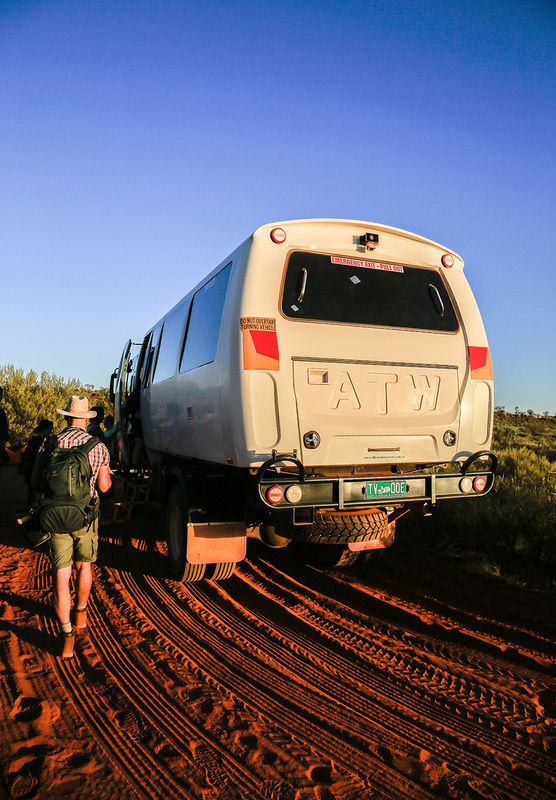 After breakfast, we headed off in our own plush ATV (all-terrain vehicle) with our guide Toby, who explained the natural history of the region as we bumped along the corrugated red dirt roads and eventually on to the sealed road to the base of Uluru. The rock changes rapidly as you approach. From a distance, its surface seems smooth, but the closer you get you begin to notice the deep ridges and gashes, jagged crests and small canyons and caves. It looms larger, morphing, monolithic, and utterly majestic. We arrive and unload from the ATV to walk the short distance to the base of the rock, and I am in awe. Superlatives fail in this landscape – no postcard or photo I’ve ever seen has done this justice – and the simple act of standing and staring up at this sacred rock takes your breath away. 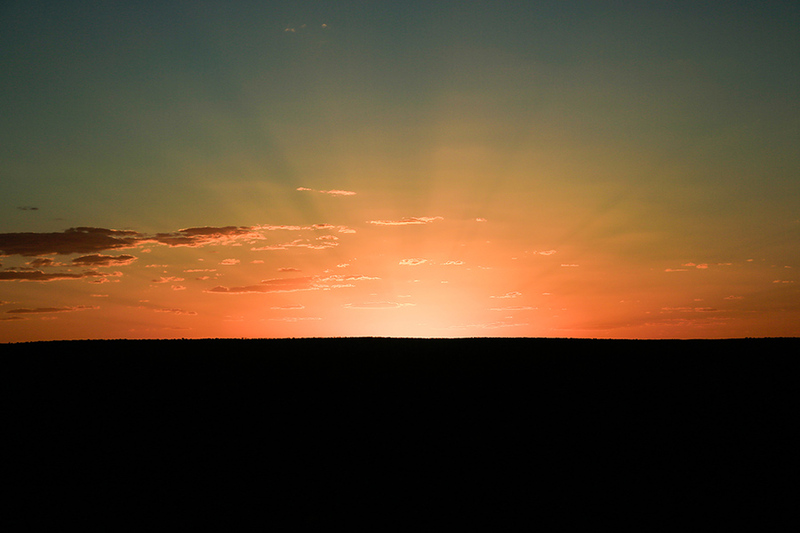 best to base your adventures around the early or later hours to beat the midday heat. 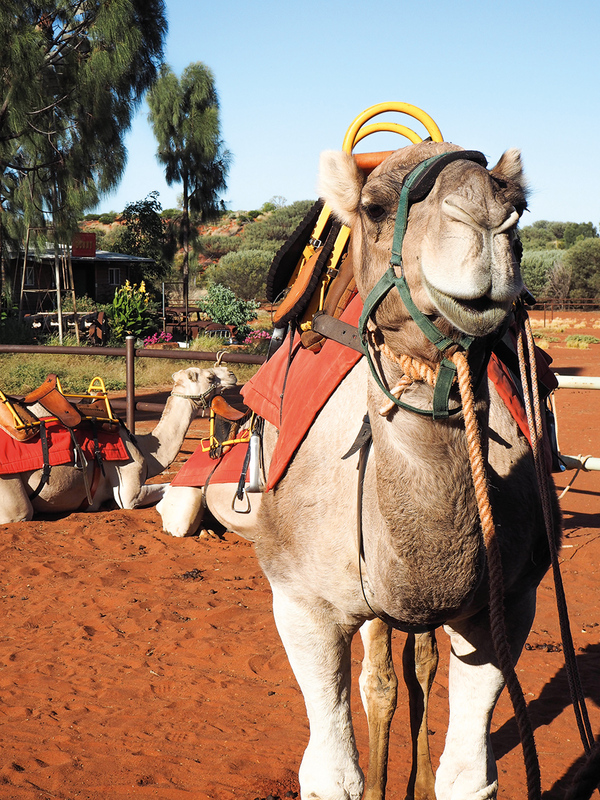 After the tour wraps up, we make a stop at the Uluru Camel Tours for a ride through the dunes, exploring this central Australian region just as the early pioneers did – on that great ship of the desert, the camel. The rest of the day is spent lazing by the pool back at Sails in the Desert before we get ready for that evening’s big event, Sounds of Silence. 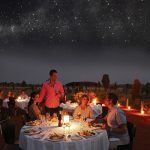 This dinner under the stars is an evening to remember with incredible Uluru as the backdrop to bush tucker-inspired fine dining in the desert, ancient stories, and star lore. 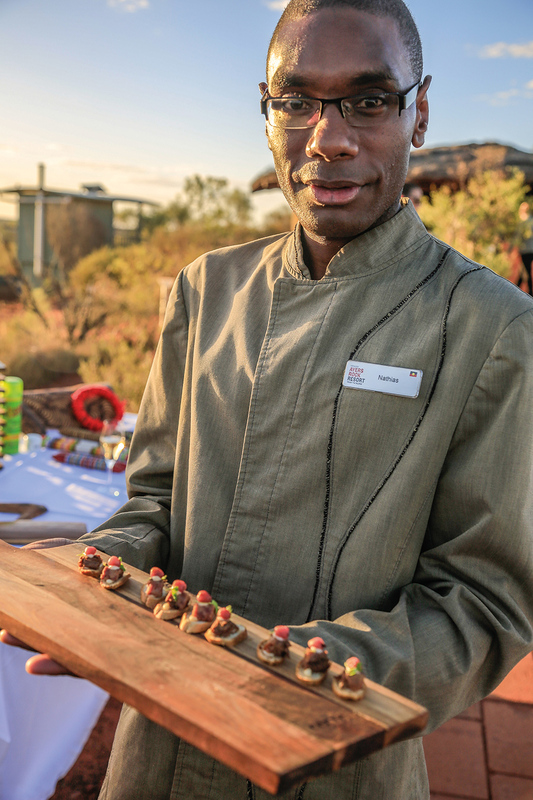 It’s celebrating its 25th anniversary in 2018, with a new Bush Tucker-inspired menu, as part of Ayers Rock Resort’s Bush tucker Journeys program. 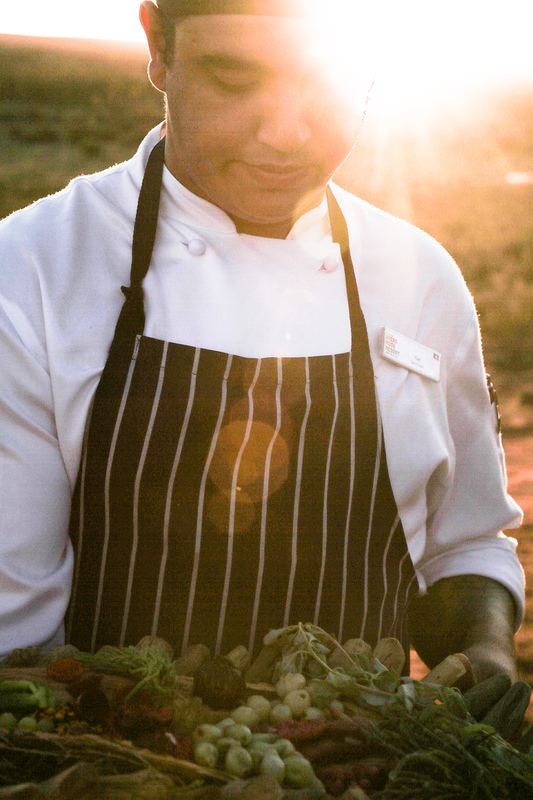 We begin with canapés and chilled sparkling wine served on a viewing platform overlooking the Uluru-Kata Tjuta National Park at the magic hour of sunset. 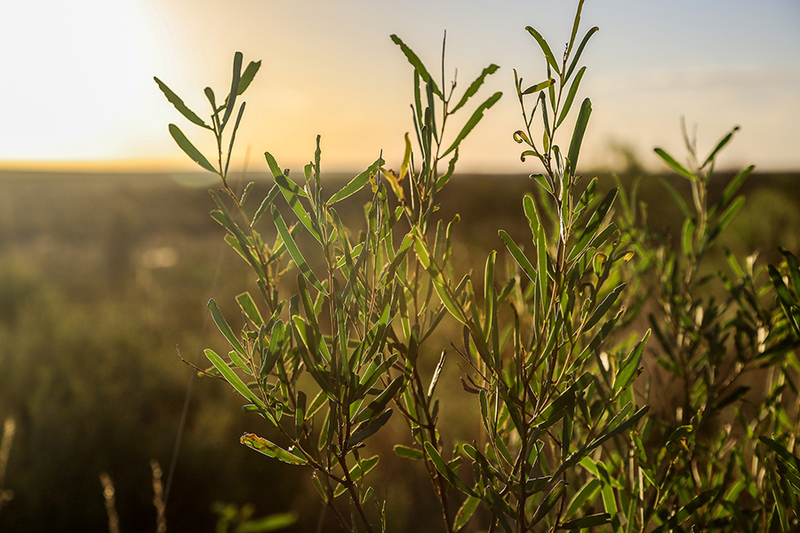 Then, a buffet dinner incorporating native bush ingredients is served with a quality selection of Australian wine and beer under a canopy of a thousand stars. There’s a magic moment when all of the lights are extinguished, and darkness descends, and for the second time in as many days, I am awestruck, as a million stars light up before our eyes. 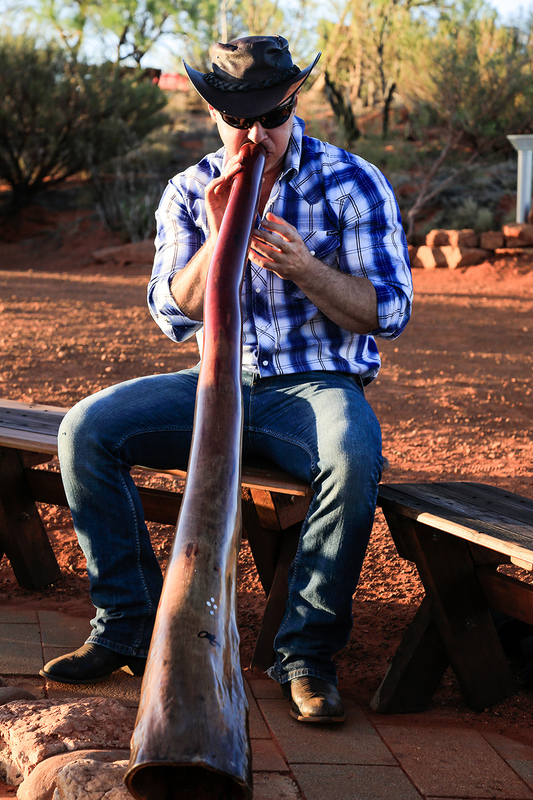 The resident star talker decodes the Southern Desert night sky, pointing out planets, galaxies, and constellations that are only visible thanks to the exceptional clarity of the outback atmosphere. And we all sit here, speechless, silent, in absolutely wonder and joy of what we see, and what we are told. An upgrade to A Night at Field of Light takes the whole experience to the next level, combining the Sounds of Silence dinner with a viewing of one of Australia’s most unique art installations, the Field of Light by artist Bruce Munro. The art installation has just had its season extended to 31st December 2020, and it’s definitely not to be missed – walking across the desert floor covered with 50,000 frosted-glass lights, which pulse rhythmically in a rainbow of stunning colours, is an ethereal and astoundingly beautiful experience. Sounds of Silence is just one part of the beautiful dining experiences offered in Ayers Rock Resort’s Bush Tucker Journeys program, and the very next night we find ourselves back at the viewing platform from yesterday’s sunrise breakfast to savour the exceptional Tali Wiru dining experience. This open-air restaurant has a much more intimate setting, with magnificent views of Uluru and the distant domes of Kata Tjuta. 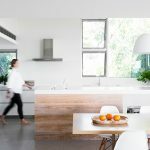 A world-class gastronomic adventure awaits, with many of the dishes showcasing the flavours of Kakadu plum, Sandlewood, Lemon Myrtle, Quandong (a desert peach), Dogwood (a style of wattleseed), fresh greens including Pig Face and Salt Bush, and even honey ants. 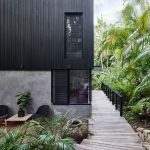 Tali Wiru is a feast of flavours, in a setting that is unlike anywhere else in the world, and we toast to the sunset and an incredible trip. 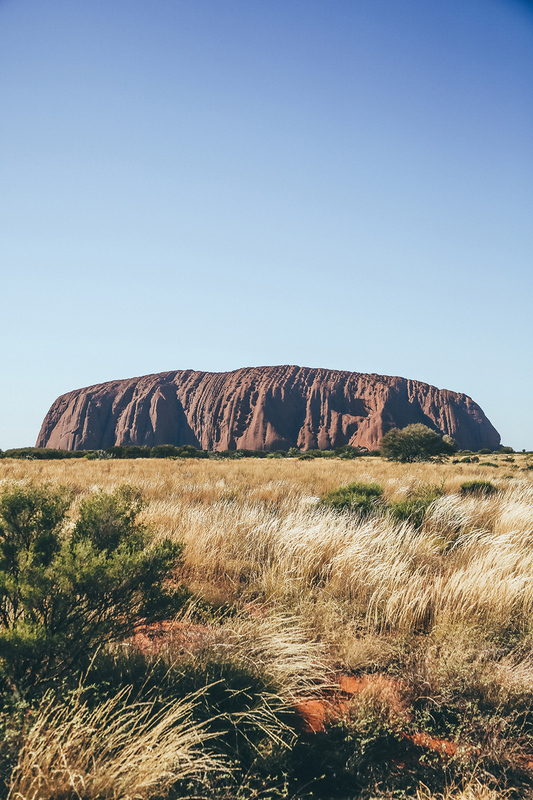 This journey on sacred ground gifted us not only the raw power and beauty of Uluru but with an adventurous, luxuriously indulgent holiday experience. We promise ourselves that, next time, we’ll make more time to explore Kata Tjuta as well. Much like the monolithic Uluru, it’s hard to ignore. The writer travelled as a guest of Voyagers Ayers Rock resort.